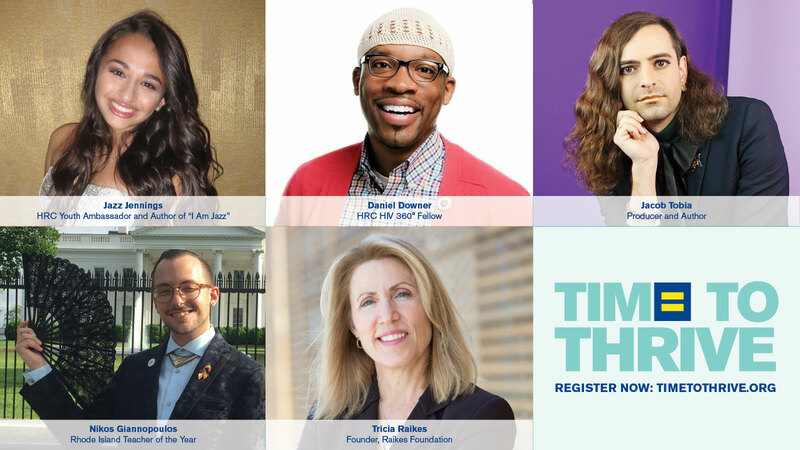 Today, the HRC Foundation announced LGBTQ advocates and allies who will be special guests and speakers at the organization’s annual Time to THRIVE Conference on February 16-18 at the Hilton Orlando Bonnet Creek in Orlando. They include HRC Youth Ambassador and author of "I Am Jazz" Jazz Jennings; Raikes Foundation co-founder Tricia Raikes; Rhode Island Teacher of the Year Nikos Giannopoulos; non-binary advocate Jacob Tobia; and HRC HIV 360° Fellow Daniel Downer. The conference is co-presented by the National Education Association and the American Counseling Association. Toyota, BBVA Compass and AT&T are presenting sponsors of the event. Jazz Jennings began her activism at age six when she appeared on "20/20 with Barbara Walters." She now stars in TLC's docu-series, “I Am Jazz” and is one of America’s most well-known transgender youth. Jazz is an HRC Youth Ambassador, a program amplifying the voices of LGBTQ youth leaders. She is the co-author of the children’s book, "I Am Jazz," and released her memoir, "Being Jazz" in 2016. Tricia Raikes founded the Raikes Foundation with her husband, Jeff, in 2002 to break down the barriers that hold young people back and build up the environments where they learn and grow -- with a focus on young people situated furthest from opportunity. The Raikes, who met at Microsoft in the 1980s and became the first couple to meet and marry while at the company, are focused on preventing and ending youth homelessness, which disproportionately affects LGBTQ youth. Daniel Downer is an early intervention specialist for the Hope and Help Center of Central Florida, Inc., and a HRC HIV 360° fellow. A leader in his community, he is known for his ability to inspire and mobilize others to work to erase the stigmas surrounding HIV, and also ethnic and gender identity, homelessness, mental health and substance abuse, race and sexual orientation. At Time to THRIVE, they will join other special guests, including trans athlete Chris Mosier; Native American dancers Adrian Stevens and Sean Snyder; advocates Judy and Dennis Shepard of the Matthew Shepard Foundation; and performer Johnny Manuel. HRC previously announced that it will honor transgender advocate Gavin Grimm with an Upstander Award during the Time to THRIVE Conference. Grimm made history after suing his school district over its discriminatory policy that barred him from using the boy’s restroom, alleging that the district violated Title IX of the Education Amendments of 1972. HRC’s Parents for Transgender Equality Council, HRC’s Youth Ambassadors and HRC’s Welcoming Schools Program will also be featured at the conference. The event brings together a wide range of youth-serving professionals to discuss best practices for working with and caring for LGBTQ youth and their families in schools, community centers, health care settings and beyond. To register, visit www.TimeToTHRIVE.org.